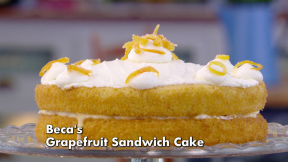 Beca's Grapefruit Sandwich Cake recipe appears in the Cakes episode of Season 2 of The Great British Baking Show. For the candied grapefruit peel, peel the grapefruit and cut the peel to the desired length and width. Place in a small saucepan, cover with water and bring to the boil. Boil for 10-15 seconds and then drain the peel. Return the peel to the same saucepan and add the sugar with 75ml/2½fl oz of water. Bring to a boil and cook for 8-10 minutes, or until the liquid is syrupy. Drain the peel and coat in more caster sugar before leaving to cool and dry on a wire rack. Preheat the oven to 180C/160C(fan)/Gas 4. Grease and line 2 x 20cm/8in sandwich tins. For the cake, mix all the ingredients together in an electric mixer. Divide the mixture equally between the two tins and bake on the middle shelf of the oven for 25-30 minutes. Allow to cool in the tins for five minutes, then turn out onto a wire rack. Meanwhile, for the grapefruit sugar syrup, place the grapefruit juice and sugar in a small saucepan and bring to a boil. Boil for around five minutes, or until the syrup begins to thicken. Remove from the heat and cool slightly. While the cakes are still warm, pierce the surface with a cocktail stick all over. Drizzle the syrup evenly over both cakes. Allow to cool completely. For the mascarpone cream, whisk the ingredients together until thick and airy, but not too stiff. To decorate the cake, place the bottom layer of the cake onto a serving plate. Transfer a quarter of the mascarpone cream into a piping bag fitted with a 1cm/½in plain nozzle, and set aside. Then spread on half of the remaining mascarpone cream onto the cake. Spoon over a generous amount of the grapefruit curd – some curd may spill over the edges but don’t worry about this. Place the other cake on top and spread the remaining cream on top of the cake, smoothing it all over so that it is evenly distributed. Using the piping bag, pipe balls of icing around the edges and centre of the cake. Place a few strips of the candied peel on each ball of icing. Serve straight away, or refrigerate until ready to be devoured.